Flight simulators do an excellent job in keeping runways free of red-faced student pilots and wrecked L-plated Jumbo jets, and simulators for the financial services industry can be just as effective. The risk of financial disasters caused by ill-trained or inadequately supervised staff can be greatly reduced by the use of such technology. It can also improve the sometimes limited understanding of financial trading in supervisory staff, a particularly sobering thought after the various criticisms contained in worldwide financial regulators and central banks following multiple rogue trader episodes in the 90s and early 21st Century. Even the more recent LIBOR rigging and Foreign exchange market manipulation issues hanging over major banks might be more readily understood and prevented by their management were they to better understand the financial markets in which their dealers operate. It is a well-held belief among regulators, bank management and market practitioners that all personnel connected with a Treasury or Capital markets dealing operation should be familiar with risk and where that risk originates - on the dealing desk, even if they themselves may never actually deal. To give all an institution’s personnel exposure to dealing in a real market environment is impossible. Giving them experience of dealing in a virtual environment however provides them with vital experience / understanding of markets and risks gleaned during hands-on dealing simulation sessions. To this end Multimedia TradeWind Limited working with the software developers Tradewind Design has created the WINDEAL range of PC based dealing simulation products. Multimedia TradeWind Limited's, dealing simulation products include WINDEAL for Spot and WINDEAL for Money market software products and are PC based ways of gaining experience of these vital financial markets. They are useful in applying theory, particularly that acquired on a training course, in a realistic and challenging simulation of a modern financial institution’s dealing room. The WINDEAL dealing simulations are a series of PC based software products, each featuring different aspects of the financial markets. They provide an ideal training environment no matter what the level of experience of the trainee. WINDEAL dealing simulations run on PCs under the MS Windows operating system and provide a virtual dealing environment where the computer assumes the role of the market in which the trainee is operating. The trainee is responsible for quoting and closing deals, managing risk positions and keeping within limits. The dealing day continues apace and, influenced by pre-programmed market trends, news flashes and deals already undertaken, the trainee has to respond to a stream of dealing requests from brokers, other bank counterparties and the in-house corporate dealer whilst himself attempting to anticipate market trends and manage the risks in the bank’s resultant positions. These dealing simulations are not however arcade games! The trainee operates in a market environment governed by prudence, limited by trading limits and counterparty credit limits - any or all of which can be altered at the whim of the Training Administrator. 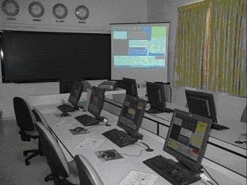 Virtually every aspect of the systems is parameter driven with the Training Administrator able to define the currencies traded, money market instruments, quotation methods, risk position limits, bank/customer counterparty names and credit limits - even the financial centres and associated world time zones displayed on the dealing room wall clocks can be customised via the administration facilities! The current product range consists of WINDEAL for Spot FX simulating the Spot exchange market and WINDEAL for Money market featuring the interbank short term cash money markets - including Commercial loan rating and funding, trading T-Bills / Bills of Exchange (Bankers Acceptances), Secondary market CDs and, at the highest training level, permits the use of short term derivatives (Financial Futures and FRAs) in either a hedging or trading capacity. All products feature screen based reports including dealers’ blotters, cashflows and mismatch (gap) positions together with dynamic P&L information. WINDEAL for Money market also incorporates the management of up to three simultaneous currency cashflows and mismatched maturities, with operations controlled within liquidity and balance sheet constraints together with capital adequacy concepts and practicalities able to be included at various training levels. The position keeping facilities on each WINDEAL simulation system replicate some of the best dynamic systems available to dealers in the real world and together with sophisticated hard copy reporting the product is an incredibly effective and flexible training tool. 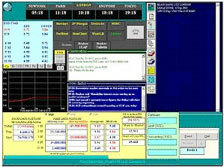 WINDEAL dealing simulation software featured on many of Lywood David International Limited open courses over the years. WINDEAL is also installed in many leading banks’ training centres, universities and banking schools around the world. WINDEAL clients are listed elsewhere on this website. WINDEAL for Spot FX is a dealing simulation system providing an instructive and entertaining way of learning trading on the Spot Foreign Exchange Market. It also has great potential for initiating trainee dealers, giving them an authentic experience of what Spot dealing is about, and giving others - management, back-office or audit staff - an understanding of spot dealing practice and the opportunities and risks therein. It can additionally be of significant help in assessing potential aptitude for dealing. WINDEAL for Spot FX simulates all the principal ways of spot dealing interbank, corporate deals, deals through brokers together with transactions through proprietary electronic matching systems. All transactions are effected by means of screen based conversations that may lead to a deal or not - depending on the student's skills in handling typical market contacts. There is a 'What If' facility with which the user may see the effect on profit and loss were a deal to be transacted, or, alternatively, to see what would be the effect of a change in market rates. WINDEAL for Spot FX keeps track of dealing performance in terms of open exchange position, position against Counterparty limits, profit and loss on dealing (figure 1 above), and how effectively the trainee operates as a dealer. It provides various levels of dealing complexity that can be set to match the differing skills of those using it. It also allows control (perhaps best exercised by a Course Supervisor or a trainee's mentor), over the volumes of incoming calls, the proportion of one type of call to another - even the speed of reaction required, so that these may be matched to different skill levels. A WINDEAL for Spot FX session is based upon a Scenario consisting of a pre-constructed set of News Headlines of world events, and an associated sequence of exchange rates which change throughout the day in response to the events. The rates are created afresh for each session, using a core trend with pre-determined levels reached at certain points of the day as set by the Course Supervisor. These form a control framework within which, dependant on training and activity levels selected, the system generates a random series of calls from other banks, brokers and the corporate dealer - giving a genuine feel of what can happen in the real dealing room. Newsflashes up to the present time appear on a rolling display and may be reviewed at any time. A hint about the effect of the current news item may be obtained (if these have been set up by the training administrator). Through the Administration function Scenarios can be constructed for any currency pair. Three complete Scenarios (essentially sets of news flashes with controls for generating rates) are provided with the product on purchase. Procedures for writing new scenarios - or changing those supplied - and for changing the permanent system parameters - are provided within an Administration facility with a comprehensive guide (provided in hard copy and as a printable Adobe pdf file) to assist Training Supervisor in the set up and use of the dealing simulation product. The system also allows temporary session changes of many of the System Parameters. These changes will be active for the current session only, and can be made either at start-up or during a session that has been ‘paused’. Typically, they would be used in mid-session to intensify or relax the pressure of events on an individual student. A WINDEAL for Spot FX user, sitting at his or her desk, deals in only one currency pair during any session; however, the simulated Market Rates screen not only displays rates for the selected Dealing Currency Pair but also for four other currency pairs chosen for display. The user can call a number of banks or either of two brokers at will and, at random intervals, these potential counterparties/intermediaries will call the user. All bank, broker and customer names can be amended via the Administration facility - making the market environment created endlessly variable to suit local preferences. Additionally open position limits and bank credit limits are parameterised and controllable by the Training Supervisor via the Administration facilities. 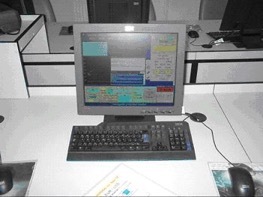 Because trainees and/or supervisors may wish to go back over events of the dealing day to check what happened and why, the system maintains full records of what has happened during a session so that these may be inspected, at any time, on screen or via a word-processing system (A WINDEAL for Spot FX uses Windows Write to display them). The records include the Blotter (a list of all deals done and which have caused the current open position), a list of deals with each counterparty, the overall positions of all customers (for credit limit control), and graphs showing the days exchange rate trends with news flashes relevant to the time of day able to be reviewed for any point (time) on the graph (figure 2). To drive home the need for dealers to respect both trading limits and credit limits the system permits monetary fines (reducing P&L figures achieved) to be imposed when parameterised limits are exceeded. These may be set via the Administration function to suit the dealing scenario and Course Supervisor’s overall training objectives. Also maintained are the Deals and Performance Log (figure 3). This is a full post-session debriefing report including closing position, P&L and displaying all deals done, the position arising after each and the user's performance indicators (exclamation marks indicating a dealing error by the user) - with information appended varying from time taken to respond to incoming calls to errors made by the trainee. There is also a Conversation Log (a record of the actual "conversations" between user, customers, brokers and the Corporate Dealer - similar to the recording of all conversations in a dealing room for later transaction verification/problem solving). 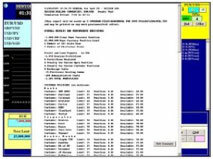 There are also Help Notes on the on-screen functions - an optional feature activated by pressing and holding the right mouse button on an object to obtain information about it. The WINDEAL dealing simulation software is available on a hire basis under as range of different options to suit individual trainers, bank training departments and commercial training establishments. Please contact Multimedia TradeWind Limited direct for further information and to discuss your requirements. E-mail: mmtw@lywood-david.co.uk. 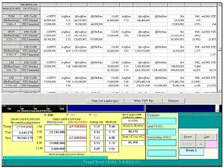 WINDEAL for Money market software provides a realistic and challenging simulation of dealing in the domestic and international interbank cash deposit / loan / Treasury Bills/Bankers Acceptances and Certificates of Deposit markets together with the short term derivatives markets using exchange traded Financial Futures and Over the Counter Forward Rate Agreements. The Money market module has great potential for initiating trainee dealers, giving them a realistic experience of what Money market dealing is about, and giving others - back-office, systems development or audit staff - an understanding of interbank dealing practices, asset and liability management and interest rate risk management techniques. The product can also be of significant help in assessing potential aptitude for dealing. WINDEAL for Money market simulates all the principal ways of dealing in the money markets - including interbank, corporate contact and dealing via a broker. Contact is possible with a Futures broker in respect of STIR Futures trading. Parameters in the system also permit communication between the dealing desk and the in-house commercial lending department managing credit facilities (roll-over loans and new drawdowns) granted by the institution to its key corporate clients. All contact takes place via screen based conversations (figure 1 above) with the various types of counterparty in the system and lead to a deal - or not, depending on the user’s skills in handling typical market situations. In the foreign exchange market volatility is the market’s driving force. In the money markets this is not so much the case, with market interest rate changes more subtle. Whilst managing the on-going cash requirements / liquidity of the institution other important aspects of a money market dealer’s job such as deciding upon the funding corporate loans, considering short term derivatives for hedging or trading application, squaring up the short date Nostro cash positions and responding to incoming corporate deposit rate requests generate the activity levels to keep the trainee totally fully involved. WINDEAL for Money market keeps track of the trainee’s dealing performance in terms of cashflow and mismatch (gap) positions (figure 2), liquidity, trading positions (portfolio totals of Bills, Repos *, T-Bills/BAs, CDs, Financial Futures and FRAs), positions against Counterparty limits, profit and loss on dealing, and how effectively he/she is operating as a dealer. The system provides various levels of dealing complexity that can be set to match the differing skills of those using it. It also allows control (perhaps best exercised by a Course Supervisor or a trainee's mentor), over the currencies and products traded, volumes of incoming calls and the proportion of one type of call to another - again so that these may be matched to different skill levels. A WINDEAL for Money market simulation session is based upon a Scenario consisting of a pre-constructed set of News Headlines of statistical announcements and world events, and an associated (generated) set of interest rates (short dates and fixed periods out to one year) which change throughout the day in response to the events. The rates are created afresh for each session (unless a scenario from a previous session is requested) and form a control framework within which the system generates a random series of calls from customers, brokers and the corporate dealer - giving a genuine feel of what can happen in the real world. Scenarios can be constructed for one, two or a maximum of three currencies. figure 3 below details an example of the Training Administrator’s scenario update screen facility. US Dollars are a default value with the other two specified through the Administration function. 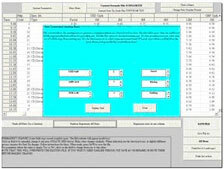 All currencies can be input with correct ISO codes, effective dealing dates and interest calculation bases.